A celebration of Life will be held at St. Andrews Methodist Church, 540 School ST. SE Lacey WA. on Saturday January 19 at 11am. 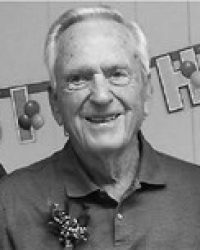 Leland (Lee) Lovrien Leland (Lee) Lovrien, 96 passed away January 9, 2019 in Olympia, WA. Lee was born September 13, 1922 in Eagle Grove Iowa to Charles and Mary Lovrien. Lee enlisted in the Army at age 18 and retired as a Major after 20 years of service. He was a veteran of WWII and Korea. While in the military he married Lila Adcock on November 5, 1944 and started a family. Daughter Nancy was born followed by a son Mark. After military service Lee went on to work for the Dept. of Natural Resources for 21 years retiring in 1982. After retirement Lee and Lila traveled extensively and ended up spending winters in Mesa Arizona. Lee was an avid woodworker, golfer, and loved playing cribbage and being with family and friends. He was a member of St. Andrews Methodist church for over 55 years and was involved with building of the church as well as many church activities. He built the church altar furniture in his wood shop at home. He was preceded in death by his wife of 62 years in 2007. He is survived by his daughter Nancy Kauffman Lovrien and husband Bruce, his son Mark and wife Lois, granddaughter Angela (Arnold) McPherson and great granddaughters Nya and Denae, grandson Matt(Kelli)Schmidt and great grandchildren Sterling and Kelsey. He is also survived by his brother Everett (Masako) Lovrien of Portland Oregon, sister Eunice Ellerbrock of Sac City IA, sister Lynn (Fred) Maiocco of Yakima, WA, brother in law Bill (Mary) Adcock of Newburn Tenn. as well as numerous nieces and nephews. A celebration of life will be held at St. Andrews Methodist Church, 540 School ST. SE Lacey WA. on Saturday January 19 at 11am. In lieu of flowers donations may be made to St. Andrews Methodist Church.